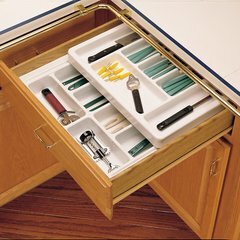 Increase space in kitchen drawers with this unique rolling tray system. 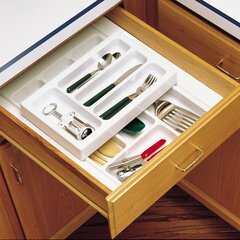 This insert is made of heavy gauge polystyrene and features a high gloss finish and a removable rolling cutlery tray. 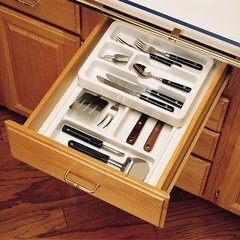 Minimum Cabinet Opening Width : 14.75"
Minimum Cabinet Opening Depth : 16.75"
Minimum Cabinet Opening Height : 3.12"
The peg system I ordered was too small so I needed to return it for a different size. The return shipping was $65.00! I won't be ordering from Cabinet Parts again. The products are of good quality but the return process is cumbersome and the return shipping expense is not worth it. I bought a 50 inch width and cut it in half easily with a Dremel tool. That made two perfect pieces for my 25 1/2" drawers. Holds about 60 spices in each drawer. Exactly what we wanted. I think the product was probably just fine. My problem is with the sales staff on the phone, and the advice I was given. I was told that this product would meet my needs but it absolutely did not and I had to return it. To top it off the company wouldn't pay for the return shipping so I was out $17 for the mistake of doing business with this company.